Commercial Novel, is a long shot born from economic desperation. Currently, the novel tracks the lives of Colin and Sylvia Andrews as they struggle to keep their house. Sadly, Colin’s primary plan is to write a novel—a “Great American Cybernovel”—offering readers the chance to buy their way into the text. At the uncomfortable crux of crass commercialism, literature, genre-fiction, talking point politics, and economic crisis, Commercial Novel irreverently negotiates the thin, blurred lines between integrity and sales, truth and fiction, and hope and despair. It’s also kind of funny. Commercial Novel has not been tagged yet. 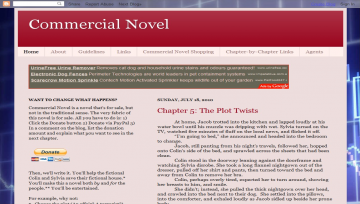 Help others find Commercial Novel by tagging it! Commercial Novel has not been reviewed yet. Commercial Novel has not been recommended yet.